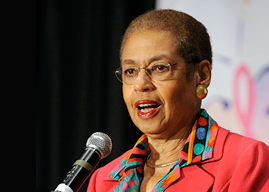 Washington, D.C. - We Are Woman is thrilled to announce that distinguished congresswoman, Eleanor Holmes-Norton, will be providing the opening address at their national rally for women's rights taking place on Saturday, August 18th at the United States Capitol. The rally begins at 10:30am and will include a full program of feminist speakers, musical performers, and comedians. Each speaker will be focusing on at least one aspect of the women's rights movement within the context of the current war on women being waged by conservative politicians like recent vice presidential nominee Paul Ryan. Washington D.C. - We Are Woman, the grassroots organization behind the national rally for women's rights taking place on the west lawn of the United States Capitol on Saturday, August 18th, has announced that the rally will be starting at 10:30, rather than 11am. The change has been made in order to accommodate the tremendous number of speakers and entertainers who will be in attendance. The newest speakers to sign on for the event include filmmaker Kamala Lopez, who will also be recording at the rally, Andrea Gleaves of the Women's Information Network, and Alice Cohan of the Feminist Majority. WHO: We Are Woman, a grassroots organization devoted to promoting women's rights and using peaceful protest to unite against the war on women being waged in statehouses throughout the USA and by our current congress. WHAT: A rally for reproductive freedom, the Equal Rights Amendment, and fair pay.